Mariana Stjerna is a highly respected Swedish channel and author. She has been psychic since childhood and has written several spiritual books both for adults and children. The Invisible People is the English publication of her Swedish novel Det Osynliga Folket. Other examples of her international releases include Agartha - The Earth´s Inner World, On Angels’ Wings, Mission Space andThe Bible Bluff. Do you know that invisible beings, Nature Spirits, of the most various kinds exist in Nature, and that every one of them has a special task? Through our ignorance we kill and scare off these Elementals with our toxins, our violence, and our insensitivity, which already have had dire consequences. But it has not always been so. Once, a long time ago, humans cooperated with the Elementals in harmony and balance, and to this unity we must return. 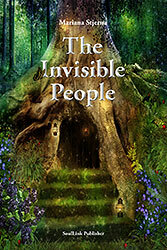 In this book, The Invisible People: In the Magical World of Nature, the writer’s spiritual inspirer, Jan, together with a religious historian and two Elves, will make peepholes into different ages – from about 20 million years ago and forward – in the greatest, most magical, and secretive of all worlds: Nature. The mission is to inform people about the magic of Nature and also to investigate when, where, and how humans, Elves, and Nature Spirits cooperated in good spirit. The time journeys are always started from Mother Earth’s beautiful green cave in the innermost of the Earth. At the end of the book are included a number of channeled messages from Pan, the uncrowned ruler and King of Nature. Outer Space is infinite. How then is it possible for humans to be so arrogant as to assume they are the only living beings in the entire universe? How can human beings be so presumptuous that they only believe in that which can be seen with their physical eyes? How can they encourage their limitations to such a degree that these define their only acceptable truth? Why not simply admit that we limit our field of vision, and accept the fact that there are those able to see behind the veils we generally have in front of our eyes? For there are indeed veils, but it has not always been so. Above the hill swept the Ulriksdal forest. There were some tracks in there that I knew like the back of my hand, but one day I went along an unfamiliar, winding animal track leading to some big trees encircling a spring. I had never come across it before and I cheered, danced, and sang for joy over this magnificent, prodigious discovery. This became my very own secret spring, barely a few yards wide and rather deep. The water was clear; I could see right down to the bottom, where the pine needles and moss tumbled about as in a rhythmic dance. A few small leaves sailed around on the surface and I saw with delight how the roots of the trees formed walls around the spring. In the very same root meanderings, the fairies dwelt. Of this I was completely certain, for I had read the book Peter Pan, and I was convinced that every word in it was true. I was six years of age and much alone, described as “an imaginative child” by my unimaginative mother. The spring in the forest became my own clandestine place of consolation. There I could sit and daydream at great length, without anyone missing me. My mother liked to take a nap in the afternoon, while the housemaid and the cook had better things to do than chasing the “little miss” out in the forest. In my childish fashion I would sit and meditate by the spring, my head filled with fairy-tales, breathing in the lovely scent of the mixture of deciduous and evergreen trees. During the summer I would, without permission, splash my feet in the spring water; other seasons I simply enjoyed watching and feeling the atmosphere. I clearly saw fairies and goblins all the time, although I can’t swear if it was with my physical eyes or my mind’s eye. Anyhow, they became my friends, and even if they were invisible, I spoke to them. They were the kindest of friends, precisely the sort a lonely child needs. That was how it began. I lived within two worlds, the mundane one, ruled by my dominating mother and dearly beloved, kindly father, and the daydream one by the spring in the forest – acting as a source of inspiration. Throughout my adult life I have longed to revisit it, but now new settlements have devastated the beautiful piece of forest where natural life and inspiration penetrated the listening ear of a small child. Another vivid memory comes from the Animal Kingdom. It’s a memory of a less pleasant nature; nevertheless it has also persecuted me. I was even smaller then, perhaps three years of age. I was walking through the forest with my nanny when we suddenly came upon a tiny baby squirrel, which had apparently fallen out of its nest. We brought it home with us, to my mother’s great dismay. She was not particularly fond of animals – which is perhaps why I have become all the more so. However, this occurrence has haunted my mind many times during my adulthood and I’ve never really understood it. I was allowed to keep the baby squirrel in my doll’s bed and I clearly remember that we fed it cream and sponge cake crumbs. But still, it died in an unpleasant way. I can see this scene clearly: I was standing in the serving room, adjacent to the dining room, together with the housemaid. The baby squirrel sat on a bench, just underneath the china cabinet. It had just stuffed itself with sponge cake and I’d held it in both hands, wishing to say how much I liked it to its face. I squeezed it too hard. To this day I can still feel its soft body between my hands as the housemaid shouted so loudly that the cook rushed away from her pots and pans to see what the commotion was. Both of the women scolded me and took care of the little animal, but it was already dead. My mother, rudely aroused from her beauty sleep, also scolded me. I don’t recollect whether my father scolded me as well, but I don’t believe so. Neither do I remember if I got beaten, however I remember how terribly unhappy I was and can still recall the despair I felt at having killed a small animal. No one tried to understand me, comfort me, or at least talk to me. Instead, everyone merely blamed me. I felt a terrible guilt. As mentioned earlier, my strong love for animals might be rooted in this event. I have had many animals: horses, sheep, goats, chickens, and of course cats and dogs. Somehow I have, during my entire life, tried to atone for that incident. Yet it is crystal clearly imprinted in my memory in the form of guilt, even though I have forgiven myself a long time ago. I do know how important it is to truly forgive oneself. I have a memory from the Mineral Kingdom as well. This is one in adulthood, when I was cycling together with my two daughters along a gravel road in the countryside on a beautiful summer’s day. I was the one farthest back. All of a sudden I spotted a stone, about the size of the palm of my hand, and felt compelled to stop my bike. It was as though someone inside of me commanded me to take up the stone and hold it to my ear. I did so – and it sang! I could swear, it truly did sing to me. Shells can sing, but I’ve never heard of stones on a gravel road in the countryside that can sing. The girls impatiently called to me, reminding me that the bun-dough rising back at home might be ruined. I put the stone in my pocket and biked after them. The stone never ceased singing. I don’t know where it is now. Unfortunately it disappeared, but it inspired me to start artistically painting stones, and I later had an exhibition in Stockholm displaying my art stones. Somehow it also became a sort of inner song, a stone’s secret message to me, and it still remains inside of me. It told me that everything in Nature is alive. If a small stone can sing, then a big rock can rumble and a mountain can transmit an icy melody. I still have a special love for stones, both precious ones and those naturally polished by time, creating remarkable shapes and colors. To most people, stones are just stones. Not to me. Every grain of sand, every stone, every cliff, every rock, and every mountain has life. Life takes care of life: Nature’s living (and to us) Invisible People take care of Mother Earth’s physical creations. You doubt this? Well, that’s why I’m writing this book. My adventurous angel friend Jan has not abandoned me. He would like to tell about his latest adventures in the Magical World of Nature. He is assigned to the most remarkable missions in the dimension in which he dwells. After having completed his mission as a truth seeker in the world of the New Testament (see The Bible Bluff), he has now proceeded to the magical book of Nature, with all its millions of written and unwritten pages. Magic of any kind is exciting. It’s like a prism of crystal, full of multicolored alternations, full of superstition, but also full of a deep wisdom. The latter is the most interesting. Our dreams, daydreams, visions, hidden hopes, and undisclosed experiences – the things we hold secret, call supernatural, and don’t understand – are all concealed in the magic. Yet the most magical and mysterious of all is the Nature in which we live and which we compete to destroy. We see only what we want to see in a world that contains vastly more than what our eyes perceive. We wander around blind in our everyday lives, dismissing the unseen around us as mere delusion and superstition. In an attempt to alter this attitude, Jan has delved deeply into the greatest, most magical, and mysterious of all worlds: Nature. I enjoyed being able to hand over new information concerning the historical events of the New Testament. It was fun making peep- holes into such an interesting era, and delving into the lives of the “celebrities” of that time, who in many ways proved to resemble their modern counterparts. Throughout all time there have always existed “modern” people, because feelings and thoughts stem from the same original source. I am now sitting at home in the Angelic Realm, contemplating what will happen next. So far nothing has happened, and that’s why I’m yawning. Even angels can yawn. Angels need to be fully occupied, just like humans do. We don’t get hungry for food, but we get hungry for knowledge. We also get hungry for energies. What you call energies is an infinite amount of rays in all colors and more, both light and dark ones. Who invented the word “energies,” by the way? In our time it has become a trendy word. The world of energies is for us deafening and tumultuous, full of surprises, but also of wisdom. You never tire of the discoveries in this world, but in fact, they have to do with feelings, perceptions, and to some degree radiation. I have been told that I should rest, but this is something I find really hard. Perhaps I’m just a restless spirit, but I dearly wish to feel that I am accomplishing something worthwhile. Many also find it difficult to understand how I can reason in such a human-like manner. It’s not hard at all. In my thinking, much of the human remains – my medium on Earth is well aware of that. Otherwise I wouldn’t have been assigned to my previous missions, and I hope for more of these to come. I also hope that someone noticed I yawned. It’s not easy to have any secrets here. That’s probably why there was a knocking at my door right now! In came my good friend and former religious historian, the lovely spirit Lydia. Her long brown hair gleamed like old copper and her radiant brown-green eyes shone. All her lovely appearance looked as if she had something important to communicate, and I was certainly not mistaken! I jumped up out of my comfortable chair. Gone were my former tiredness and boredom, gone was the source of my yawning. Life – that is, my angelic life – had once again become exciting. “May we become humans sometimes?” I asked. The gently smiling man who came towards me was quite tall and was wearing a dark violet cloak. He had a very peculiar face. It was thin, with high cheekbones, and his eyes were slanted and honey-colored. His eyebrows were almost grown together over the root of his nose and they were as fair as his shoulder-length hair. His nose was large, but not bent, and his mouth, albeit narrow, was well shaped. His hollow cheeks were as though sculpted with deep lines. His gaze was sharp, and it instilled a feeling of deep wisdom. The body underneath the shimmering silk cloak seemed thin, but at the same time lithe. A female being appeared at his side; she was called Thesa. She, too, was wearing a violet cloak. When she pushed back her hood, she showed a beautiful, although unusual, face. She appeared as her companion: thin, almost transparent. Her face was pale and her large eyes were a dark honey color. Her cheekbones were high and gave an almost Asian impression. She seemed more vivacious than the man, and she smiled gently the whole time. Her pointed ears were adorned with exquisite pearl earrings, and I glimpsed a pearl necklace around her neck. Who were these: humans, angels, or … well, what? “We will accompany you, Jan and Lydia, on a remarkable journey,” the man continued. In contrast to his slender, thin figure, his voice was surprisingly dark and deep. There was something compelling, something unknown, strong, and strange in his entire appearance. I noticed that his hands were well shaped and that his unusually lengthy fingers had long, pointed nails. On his right hand he wore a gold ring, which was wide and very ornate. In its patterns, stones were glittering that I supposed were amethysts, turquoise, and rubies. “But he has now!” Melchizedek was standing in the room, tall and radiant, as the high Master he was. I forgave him instantly. Probably he had his reasons for holding back the information. Maybe I wasn’t always obedient or easy to find, and perhaps he wanted to see my reaction when it came to the elves. Well, to be honest, I never thought that elves were for real – only that they existed in fairy-tales and legends. It was certainly true that we needed company to penetrate the secrets of Nature – a magic-skilled and fascinating company who could lead us on the right track in all dangerous nooks and crannies. The Earth was our original home – Lydia’s and mine – which we knew well and which we loved. To discover new, hidden parts of it seemed like a hair-raising adventure. Maybe we would get to experience the wood nymphs and the trolls for real! I reveled in the thought. But the thought was read by Melchizedek, who gave a hearty laugh.